Can you avoid frumpy while prioritizing comfy? Can you be a stylish mom without compromising your ability to be a fun mom? 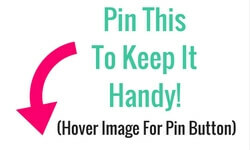 Can you look put together at home without feeling silly? I would give a hearty “YES” to each of these questions. And in today's post I’m going to explain why. I put on waterproof mascara when I know it’s going to be an emotional day because I don’t want the worry of smeared makeup to hold back tears. On emotional days I want the emotions to flow. It’s no different being a mom and deciding what to wear in the morning. I anticipate what my day holds and dress accordingly. With two little boys in the house and another one sitting like a taut basketball in front of me all day, my life has needs that I don’t want to ignore with what I put on in the morning. So what’s my “waterproof mascara” for everyday life as a boy mom? Here are the rules and strategies I use to be a put together mom without compromising comfort, or feeling like I'm trying too hard. The first important step in achieving chic but mom-friendly style is knowing and embracing your style. More specifically: your at-home style. Some of you would feel silly wearing any jewelry when you’re just home. Others just can’t function in anything dressier than yoga pants and a tee. I personally dislike wearing athletic clothing unless I'm actually working out, so dressing up a bit makes me feel better. Your personal preferences are important to understand and embrace, otherwise you will feel out of sync and soon drop the effort to get put together. There's no point fighting the frump if you just feel silly! I think we all share a common goal: to look put together but also be comfortable for everything the day holds. And you know what? You CAN avoid frumpy if you keep some simple strategies in mind. Here are those strategies for looking put together without sacrificing comfort (or feeling out-of-sync with what your day holds). A clean, fresh appearance can be achieved by simply washing your hair, combing it, or taking a minute to add a few fresh curls to your pony tail. Then do your very basic mom makeup and you’re good to go. I’d say this is THE most important part of looking put together, and it doesn’t involve clothes! My hair + makeup on most days takes 5-10 minutes but without it, it doesn't really matter what I wear--I'll still feel frumpy. Prioritize achieving that clean/fresh appearance (even if you use dry shampoo to camouflage the need for a shower when you're short on time). Clothes that fit you well will ideally balance your body features rather than try to hide them. Focus on the favorite aspects of your body and play those up. Ditch the baggy tees and falling pants. Trying to hide parts of your body that aren't your favorites only accentuates them more. Shoulder seams should fall on the shoulder, not past them. Skirts should land either above or at your knee. Maxi style should touch your toes not drag on the floor. Pants should land at the ankle if skinny style or just brush your toes if boot cut style—no bunching up at the bottom. And less is more! It’s better to have just 2-3 great fitting shirts on rotation over a drawer-full of worn-out, floppy ones. It took me a while to embrace the scary concept of throwing out most of my less-than-perfect collection of clothes, but once I did all my favorites finally got a chance to shine. I fell in love with my wardrobe again because everything in it made me happy, even if it WAS a lot smaller! Clothes that are in style will revolutionize your appearance. Use this blog and the Full Year Wardrobe plan to get acquainted with cute stay-at-home mom clothes. If you suspect an item of clothing is particularly outdated but you aren’t sure, just ask in the Facebook group. That’s the beauty of building a purposeful wardrobe… when you have a nice blend of classic and trending pieces, building an outfit becomes effortless. The outfits in the Full Year Wardrobe always start with 2 basic pieces (or one if it’s a dress). From there they build with accessories to increase the “completeness.” When you have the right pieces (and you follow the rules from Strategy #1), even the first two pieces in your outfit will give you the “put together” look while allowing maximum mobility! If you’ve covered the three keys to looking put together (fresh appearance, clothes that fit you well and clothes that are in style) you can go as simple as you’d like while you’re home—and you won’t feel frumpy! Wear the simplest version of an outfit in the Full Year Wardrobe when you’re just home cleaning, cooking or chasing your kids around. Seriously, when your hair shows some intentional care and you have some basic makeup on, any simple shorts + tee or yoga pants + hoodie can achieve a very put together look that is appropriate to being at home. When you start with an in-style, well-fitting outfit base from the Full Year Wardrobe, you can simply throw on a layer or two of accessories to get that polished look for going out in public. I often start with shorts or pants and a tee while I’m home with the kids (hair combed and simple makeup done of course). Then when it’s time to leave the house, I add my statement earrings, maybe throw on a vest and slip into my t-strap sandals, sneakers or flats. Because I took care of my hair/makeup for 5-10 minutes when I first got up, I don’t even have to think about that and I'm instantly dressed up. Depending on the level of formal you need to achieve, you can either wear all the recommended layers of an outfit or use one of the outfits that incorporates a dressy piece like a blouse, dress or flats. You don’t need a ton of clothes! Stick with what fits you well and makes you feel pretty without much fuss. I haven’t worn a ton of variety lately—I’m just sticking with a few tried and true outfits during my second and third trimesters that make me both look and feel great! I’ve been rotating between 6 excellent shirts and about 4 bottoms. Two are neutral solid tees, two are pattern tees, and one is striped. My bottoms also cover the basics… denim, color pants, color shorts, and pattern shorts. From these basic combos, I add a couple of completer pieces and jewelry and fun-but-comfy shoes when going on errands and to appointments. If you're thinking "I would feel stressed wearing such a nice top when I'm just working around the house!"... actually this maternity top was just $7.99 at Ross. Most of my clothes are either bought on consignment or from an affordable source like Amazon.com, Target, Jane.com. The quality isn’t always top-notch, but it doesn’t have to be. There is too high a risk of clothing getting shrunk in the dryer (I never dry-clean and rarely hang dry), getting pulled and stretched by little ones, or stained by all the cooking and dishwashing I do on a weekly basis. I simply won’t spend a lot on my regular clothes because I don’t want to stress about them getting ruined! And you know what… I have a cute wardrobe that I LOVE. Low-cost doesn’t mean frumpy. It’s just smart for most moms to spend less on their daily clothes if they'll be around kids and the kitchen a lot of the day. Of course, I do recommend paying more for some long-lasting items such as leather boots/bags, quality bras, and basic dark-denim jeans. These are worn on repeat and not easily damaged so you should buy them once and have them last for years. Sometimes paying a bit more is worth it. You guys. There are so many comfortable trends every single year. What comes to mind right away is athleisure, crossbody bags, striped tees, hoodies and tops with feminine details, sneakers, rompers, slide sandals, denim, high-waist pants and shorts, snap-back baseball caps, messy buns. Comfy trends moms can take advantage of to fight the frump comfortably! You can look super in-style while being ultra comfortable when you take advantage of these trends! Simply search Pinterest for how to style these pieces and you’ll quickly clue in to how to rock them. Basics don't have to be boring! You can get a comfy tee that also has some other fun detail such as peplum cut, ruffle sleeves, floral pattern, lace cap sleeves, or crisscross back. Wear one of these with color chino shorts and you’ll be free to chase your kids around at the park while still looking like a chic mama. Have you seen all those cute hoodies sold on online boutiques like Jane.com or Mindy Mae's Market? Wear one of these with your favorite pair of jeans and lace-up sneakers for an easy, laid-back look that gets you comfortably through your errands. So that's how I achieve the "put together" mom look without sacrificing my need for comfort and mobility, and without feeling "silly" and overdressed while at home! Can you avoid frumpy while prioritizing comfy? YES. Can you be a chic mom without compromising your ability to be a fun mom? YES. Can you get put together daily without feeling silly? YES. Remember to use these basic strategies to get dressed with "waterproof mascara" every day at home! What's YOUR Go-to Mom Uniform? Let us know in the comments! 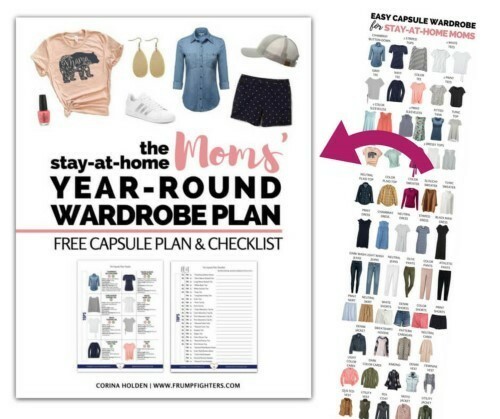 Download your free copy of our Full Year Wardrobe Plan to learn about cute and stylish but comfortable clothes for stay-at-home moms.